Who has time for chores? Startup Alfred -- named after Bruce Wayne's British butler -- thinks everyone should have access to an affordable servant. So for $128 a month, "Alfred" stops by once a week to tidy up, sort through mail and fold laundry. In addition to the chores, Alfred acts as a concierge to help manage things like dry cleaning and grocery shopping. It partners with startups like Instacart (a grocery delivery service), MyClean (a home-cleaning service), Shyp (shipping), and TaskRabbit (outsourcing household jobs). While users pay the standard fees for these services, they don't have to bother coordinating the timing or giving everyone a set of keys. Alfred is meant to give people that "25th hour in your day," said cofounder Marcela Sapone. (Though the time an Alfred actually spends at a residence varies). Sapone and co-founder Jessica Beck came up with the idea after hiring someone to help Beck with laundry (who then started coming once a week to take care of things like grocery shopping). The two invited their friends to also use the service while attending Harvard Business School. "We didn't have the intention of it ever being a business," said Sapone. But after the duo spent 18 hours brainstorming the service for a Harvard assignment, they decided to keep pursuing the idea. They eventually dropped out of school to work on Alfred full time. "It's a really good service for parents who work and are juggling a family," said Sapone. "[And] for young professionals putting in a lot of hours [or] entrepreneurs who are busy trying to launch what they're passionate about." It may sound indulgent, but investors seem to think that more people will want to cash in on that extra hour. Alfred beat out 26 other startups to win $50,000 at the 2014 TechCrunch Disrupt competition in San Francisco. 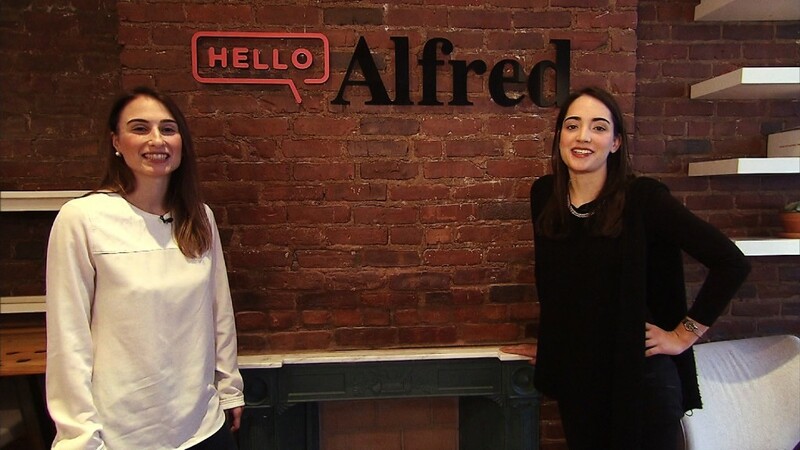 Alfred has raised $12.5 million in funding from investors like Spark Capital (investor in Twitter (TWTR), Warby Parker and TalkSpace), as well as SV Angel and CrunchFund. The funds will be used to help reach more customers in more locations. Alfred already services "thousands" of customers in Boston and New York. Next on the agenda is to launch in San Francisco and Los Angeles, said Sapone. Alfred is also serving New York City's first micro-apartments, Ollie, which began leasing in November. Spark Capital general partner Bijan Sabet told CNNMoney last year that Alfred has uniquely stood out: "We met a ton of startups thinking about the problem, but this is the first time I saw a team with a real obsession for thinking about the user experience." Part of this means creating a trusted base of Alfreds. All must undergo "very rigorous" background checks including "five different layers of interviews," according to Sapone. Service economy startups like Uber (which Alfred partners with on some tasks) have made headlines for exploiting workers. But Alfred brings on all of its workers as W-2 employees. Pay starts at $18 an hour, and they offer health benefits. So far, they have 250 full-time Alfreds ready to make people feel like they're part of the 1%.